Book covers are not just for school anymore if you plan on keeping your notebooks for a very long time. 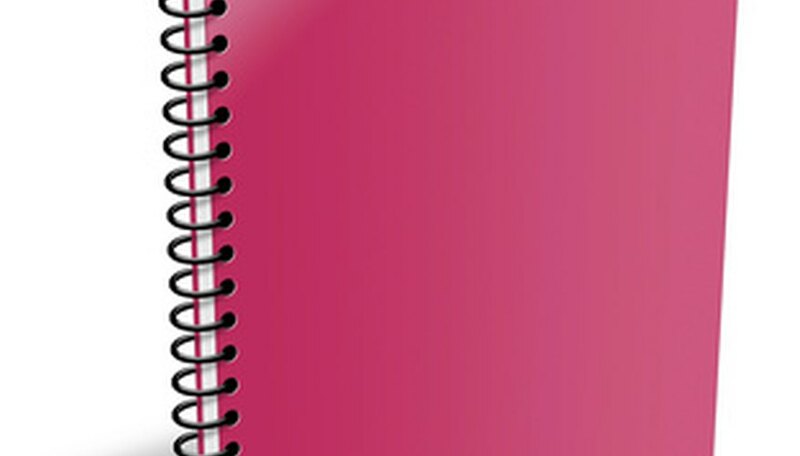 Covering a spiral notebook is a good idea since spiral notebooks tend to be flimsy. A cover offers extra protection so that your book withstands the elements and daily life. Book covers also allow you a creative outlet since the paper is like a blank canvas for you to express your personality. Measure the notebook from top to bottom and add on 4 inches to your final measurements. Open the notebook and measure the cover from side to side and add on 8 inches to the final measurement. Cut your brown wrapping paper to the measurements from the previous steps. Your cover should be a few inches taller and 8 inches wider than your notebook. Fold the top and bottom edges of the brown paper cover to the inside and tape the paper to itself on the front and back covers. Cut off any excess paper. Insert the notebook into the side covers and fold each flap to envelop the notebook. Tape the front and back covers separately to themselves. Use gift wrapping paper to cover your notebooks if you like decoration but are not the artsy type. Do not use a regular brown paper bag like you did in grade school; it is too thick for the notebook cover's cardboard and won't keep shape properly. You can only do that with composition notebooks which have a harder shell. Anya Marcot is a freelance writer for eHow and Answerbag and has been writing since 2008. Marcot has worked as a makeup artist since 1999 and now fuels her creativity with her oil paintings, watercolor paintings and writing. Marcot studied visual art at Suffolk Community College. She is attuned to level II reiki and is well-versed on many metaphysical and paranormal topics.